This is my second post detailing our spring break road trip. Please see Aso and Onsens for the first. After we left Kumamoto we made the six hour drive south to Kagoshima, Kyushu's southernmost city. Kagoshima, with its relaxed atmosphere, bay area location, hot climate and nearby volcano, made for a very pleasant and picturesque city. We stayed one night near Kagoshima's big ferry terminal before we caught our ship the following morning to Yakushima. Yakushima... When we came to Japan last July, Michelle and I had two things that we really wanted to do during the year that we were to be here. Number two was to go to the Sapporo Snow Festival, which we did this last February. Number one was to visit Yakushima. Sometimes referred to as the "Galapagos of Asia", Yakushima has a reputation of almost mythical proportions here in Japan. For a little background information, the island is small - about 500 square kilometers. It is located south of the island of Kyushu, and is considered to be the northernmost of Japan's many sub-tropical islands (which also include Okinawa). Yakushima is Japan's wettest area, and usually records a yearly rainfall in the hundreds of inches. The island's claim to fame is that it holds one of the world's last undisturbed ancient subtropical forests. 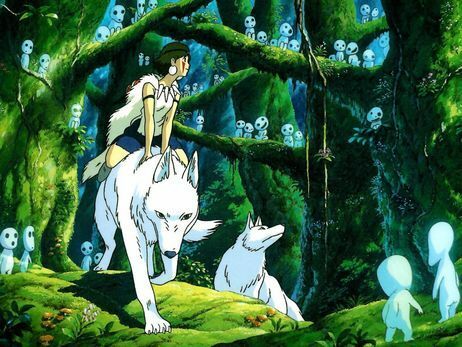 Most of the island is dedicated a UNESCO (United Nations Educational, Scientific and Cultural Organization) World Heritage site, and Hiraou Miyazaki's famous movie, "Princess Mononoke", was based on Yakushima's forests. For Michelle and I, Yakushima was one of our first completely nature oriented trips here in Japan. Over the three nights and four days that we were there, everything we did centered on some aspect of the island's beautiful natural environment. Also, in one of our better decisions, we decided to pay the extra $100 to take our car along with us on the four hour ferry ride from Kagoshima. By doing this, we were granted a huge amount of freedom in exploring the island. The island is very isolated and rural, and public transportation is almost nonexistent. The few buses that there are come around only every three hours or so, stop running by 4 or 5pm, and cover only 50% of the islands perimeter. Our car allowed us to circle the island and to reach many of the trail heads and waterfalls that are unreachable otherwise. Driving on some of the old mountain roads was a heart-pounding adventure in itself. Our first day in Yakushima could be summed up in two words: waterfalls and monkeys. We spent about six hours searching for the island's two famous waterfalls and driving around the stomach churning mountain passes along the island's west side. The views were stunning, but even more so was the island's huge monkey population that meandered along the roads. Monkey road blocks were common. Days two and three could be summed up by just one word: hiking. Lots of hiking. The most famous thing to do in Yakushima is to visit the ancient Jomon Sugi (cryptomeria tree) that sits at the center of the island. Visiting it is not easy though, as it lies 11 km away from the nearest road, and the only way to reach it is to follow an abandoned railroad track and forest trail. We were up at 3:30am to catch the 4:40am bus to the trail head, where we started at first light. The round trip hike to the tree and back was 22 km (almost 14 miles) long and took 12 hours, and that was with a furious pace that Michelle, Michael (cool Belgian guy we met and hiked with) and I undertook the last 5 km (3 miles) to make sure we didn't miss our bus back. The reward was worth it though, as we were able to explore a forest whose beauty was enchanting. Day three was more of the same, as we undertook the islands second most famous hike from the Shiratani Unsuikyo Ravine to the top of Wilson's Stump (a huge stone at the top of a mountain), which offered an incredible view of the valley. This hike also took us through the part of the forest where the artists from Princess Mononoke's animation team came to get inspiration for their film. The trees in the photos all look normal size - we tried to get close to one so one can see truly how big these bad boys are. This is the base of a "normal" size tree in the forest. At the end of our third day on Yakushima, after two days of hiking a combined 32 km (20 miles), we got to relax in what was quite possibly the most amazing onsen that there is in all of Japan. The Hirauchi-Kaichu onsen is a natural hot springs located along the rocky shore line of Yakushima that is only accessible during low tide. There are two low tides every day, and since it is mixed bathing - guys and girls all in the bath naked together - the staff at our hostel instructed us to go at night when it it's dark to avoid the awkwardness of the daytime low-tide. Trying to find the onsen was a little scary, as it lies on the abandoned west side of the island and it was already pitch dark when we drove out to find it. We did eventually find it though, and lucked out too; there was only one other guy there, so Michelle and I practically had it to ourselves. With no moon in the sky, and no light pollution, the stars and milky way were absolutely breathtaking. Here we were, in an onsen at 11pm at night, on a remote island in the Pacific, the sound of the ocean crashing on the rocks beside us, gazing up into the illuminated cosmos. Incredible. Since it was pitch, changing and packing up our stuff when we were done was difficult, so we forgot a number of items on our way out. We went at the start of low tide the next morning to retrieve them, and because no one was there, we were able to grab a quick photo. After recovering our items at the onsen, we made one more drive through the monkey infested mountain roads before heading back to the ferry port to catch our ship back to Kagoshima. Yakushima was truly a magical experience.